Happy Valentines Day to all of our family and friends...we love you! The weather here has been great this week while we've been attending the 2nd annual Western Gypsy Gathering Rally put on by the Gypsy Journal . 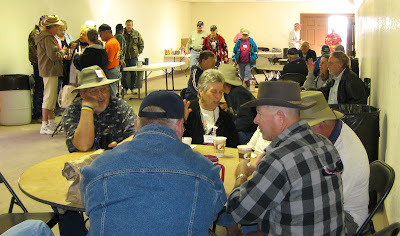 There were over 250 rv's ( motorhomes and 5th wheel trailers of all types and sizes) here and almost 500 people attending. We are in tight cozy rows in the middle of the Pinal County Fairgrounds. Most people here are fulltiming (this is their only home) while others live in their rv's part of the year. We have had limited hookups here so we sort of feel like we're boondocking. We only have 15 amp power so we have to be careful with running small appliances but we are hooked up to water so that's been nice. Even though power is limited some people go to great lengths to stay connected. 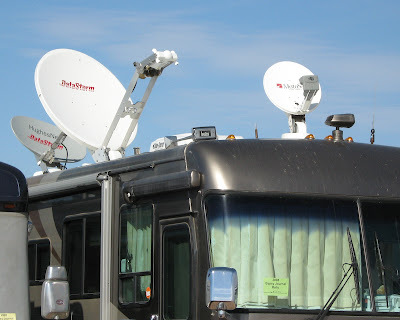 Note that this RV has 3 satellite dishes. The 2 large dishes are for internet and the small one for TV. At most rallies there are good seminars and then there are some that are just ok. This rally was no exception. 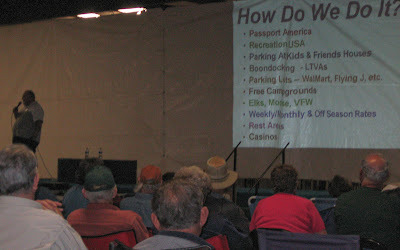 There were seminars on everything from the Frugal RVer to traveling to Alaska. But it's the people we met here and friendships we made here this week that made coming here worthwhile. One couple we spent time with are parked right next to us and are originally from Brooklyn, Michigan. Greg and Judy sold their home a year ago and began full-timing in their very nice Hitchhiker 5th wheel last April. They were very gracious and invited us over for a tour of the inside of their rv. It's very nice and spacious with it's 4 slides and has a very homey feel. We had lunch with them today at a nearby restaurant and we've enjoyed getting to know them this week. And speaking of touring rv's. Yesterday two other couples we had met invited us to see inside their rv's. One being a new Allegro Bus and the other a new Allegro Pheaton. Both are beautiful and with 4 slides they have a lot of room inside. Love those slides!! Tonight was the last night of the rally and tomorrow there will be a mass exodus of rv's. Some have already left. 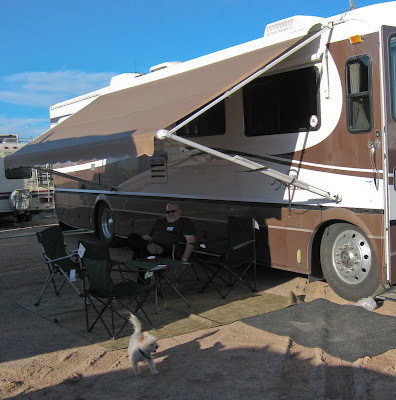 Tomorrow we are heading over to a rv park in nearby Mesa for a few days so we can get laundry done and do some shopping. We are also looking forward to enjoying longer showers instead of the 'navy' showers we have to take when we aren't hooked up to sewer connections.